I rounded a corner and stopped in my tracks. The old Kuala Lumpur Railway Station stretched before me in all her glory. Her lacy white skirts were tatted with horseshoe, ogee, and keyhole arches, while her chhatri-topped towers were held aloft like frilly parasols, providing protection from the brutal Malaysian sun. This spectacular example of British Raj style and opulence is undoubtedly the grand dame of Malaysia’s capital city. During the early years of British rule, Kuala Lumpur (KL) had been served by two smaller rail stations, but as the city grew, it needed a better transport hub. Finally, in late 1906 it was decided to build a new station. Charles Edwin Spooner, General Manager of the Federated Malayan States (FMS) Railways, oversaw the process. At the time when the world was swooning over all things oriental, the British had developed the Indo-Saracenic style of architecture, which combined stylistic elements from Islamic and Indian architecture with the Gothic revival and Neo-Classical styles. 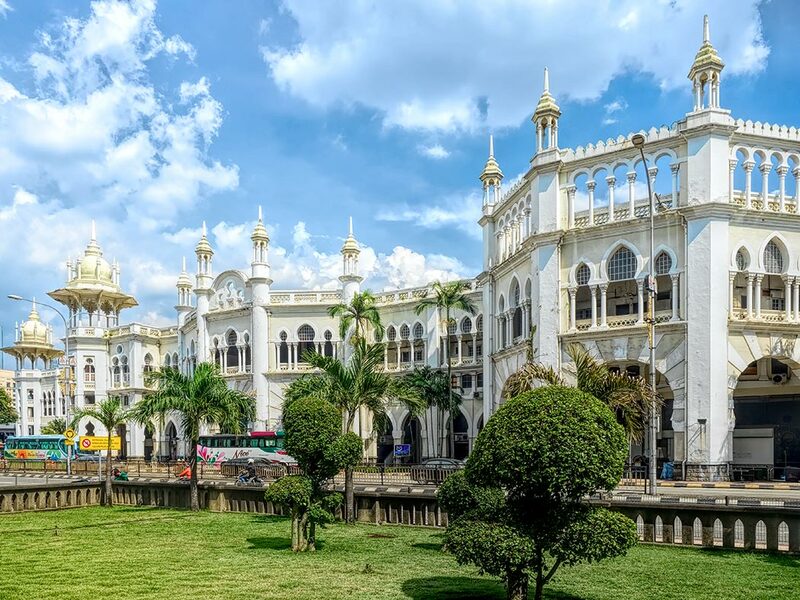 Spooner, who had worked in Ceylon prior to arriving in KL and was a fan of this architectural style, chose it for the new railway station and tasked British architect Arthur Benison Hubback with producing the final design. Competed in 1910, the station included a main hall with ticket counters and offices. Its four railway tracks and three platforms were covered by a partially open steel-framed roof that allowed smoke from the steam locomotives to escape. The northern portion and the upper level of the station housed the Station Hotel (later renamed the Heritage Station Hotel), one of a growing number of railway hotels that were popping up around the world to accommodate train passengers. In addition to 176 rooms, the hotel boasted an elegant lobby, a restaurant and bar, a health center, a ballroom that could hold 800 guests, and a rooftop swimming pool. The entire piece is an evocative and fascinating memoir of the characters and goings-on at the hotel and is well worth a read. Sadly, as he relates, the hotel endured poorly done renovations and even a transition to budget backpacker hotel before finally closing forever in 2014. He returned to the hotel for a brief visit in 2015, literally breaking in to see the shuttered hotel lobby. Even in her waning years, the old girl is drop-dead gorgeous. Architectural Digest Magazine ranks it fourth on its list of the world’s most beautiful train stations. Ashley Jackson, author of Buildings of Empire, called her the “Taj Mahal of the Train World.” Scottish railway enthusiast Adam Saylor opined, “There isn’t a station anywhere to touch it.” But words cannot possibly do it justice. There is no substitute for seeing it in person, and it should be on every list of things to see in Kuala Lumpur. Hi Mygration: I’m off again in about four weeks for Nepal, Tibet, Azerbaijan, Georgia, Armenia, Budapest, Berlin, and Munich. Happy travels to you! Thanks Alistair. It’s truly a wonder of a building. Amazing photo Barbara, thanks for giving great information. I can’t wait to see this after reading you post. Great work keep it up. ohhh, I wish I’d known about it in 2016. What a beauty! It really is, Cynthia. I hope they decide to save it. Malaysia hasn’t been to conscious about preservation, but that’s changing, thank goodness. Absolutely gorgeous! How sad that the hotel is no longer in use. As always, your photography is stunning! Thank you so much Khali! Gorgeous! I have not seen a railway station like this, ever. Amazing photo Barbara. I need to check this place out the next time we are in KL. I was completely enamored of it, Ryan. I simply couldn’t wrap my brain around why the British would have built something in this architectural style, which is why I delved so deeply into the history. Glad you enjoyed it.